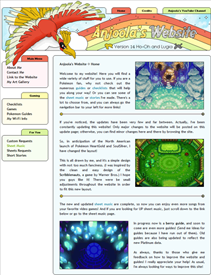 Anjoola's Website was not always the Pokémon and video game-centric fan site that you see today! In fact, its beginnings were rather strange and unexpected, and if you want to find out more, read on! This particular flavor of the website has been around since 2006, in anticipation of the release of Pokémon Diamond and Pearl. Other versions have been around earlier, and below I will explain each and every form that this website has ever taken! I first got interested in making websites in third grade, when someone did a book report about HTML (yes, strange isn't it?). I found a free web host, called Geocities (now gone) hosted on Yahoo!, and used one of the templates to make a website about... well, T*Witches. It's a book series about these twin witches, and I made a fansite for it. Basically no one went to the website, as it didn't really have anything, except some hot links to my email and homepage. In fact, I'll have to admit, it was pretty useless. But this was the first step to something greater! Afterwards, I became interested in Neopets, which is a pretty addictive online virtual pet game sort of thing. Well, on Neopets, there were various custom things you could do, like making your own blog-like thing for your shop, or your Neopets' own webpage. I thought I could make my own layouts and let lots of people use them, so CCWW was born! CCWW stood for Cloud City's Wonderful Website, since cloudcity was my username on Neopets. Fortunately I used CCWW as the name, since Cloud City's Wonderful Website is a mouthful! CCWW was a small website offering layouts, banners, buttons, and all the general stuff that many other websites offered. It was very popular and many people visited it for its many offerings. CCWW went through many cycles and layout changes, and it was constantly updated with new content. In fact, there was a time when the website featured Torchic as its main character. But even near its end, it mainly featured miscellaneous cute characters, such as Kaos and puffs, as well as licensed ones such as Sanrio and Morning Glory characters. As middle school started, I began to have less time for my website, and could not update it as frequently. Less people came to the website, until I was sure I was the only visitor. I shut the website down and began to concentrate more on school work. Alongside CCWW, I made three very personal websites -- personal in the sense that I was the only person to look at them. One of them was sort of a diary of my trip to Hawaii, and I kept pictures and detailed notes of everything I did. Another one was a diary as well, but this time it was about a trip to Las Vegas with my family. I never completed that website because I started to get lazy and didn't want to take pictures. Finally, I had a website about my trading cards. For a brief amount of time during seventh grade, I was a huge fan of Yu-Gi-Oh! and all of the trading cards (after a guy at school gave me his entire deck!). I also had some random Neopets cards from McDonalds as well as Digimon cards from way back when it was popular. I decided to create a website where I could record all of these cards and have pictures of them. It was quite detailed, with an index and links that directly went to each cards. I even had a list of Pokémon cards that I wanted, but now luckily I've got nearly all of them! The old website can be found here. These three websites were short term projects that I abandoned in a few months. (In fact, I even created a very small website that had typed-up poems and ditties from the Redwall book series. I made this when the internet was down for a week...). With eighth grade homework to be done, and high school about to start, I didn't have much time for anything, in fact. So soon, these ended as well. Around the same time I made this personal websites, I also restarted CCWW and called in Anjoola's Website. Actually, my name really isn't Anjoola but there is a long story behind this... This time my focus was Pokémon because I was getting back into gaming after my parents let me buy the super special awesome Nintendo DS. I began some of the basic guides but did not have a lot of the stuff worked out. It wasn't until high school, when I got a Wii, that I finally dedicated a lot of time to the site. 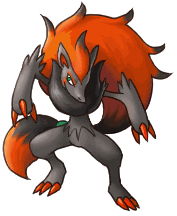 I also got more into gaming and became familiar with the tiny details in the Pokémon games. With help from some programming classes, I was able to make better (I hope) layouts and give the site more functionality. 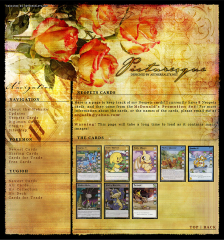 Right before the Japanese release of Pokémon Diamond and Pearl, I began the Custom Requests section of the site. This was a huge success, and on some days, I had well over 30 requests to fill out! These I will continue to do indefinitely until I really don't have time to do it. Hopefully, that day will never come! My interest in video games music started about the time when I was a sophomore in high school. I stopped taking piano lessons and started playing some songs I really enjoyed listening to from video games. If I recall correctly, the first one I ever played was the Legend of Zelda: Twilight Princess trailer song. From there on, I grew to love video game music, and to this day, it is the only genre of music I listen to. Somewhere in the wide world of webs, I found a music editor, and I found out how easily I could make the music I heard into sheets to be played onto the piano. Thus began the sheet music section of my website. After I had made a couple of sheets, I began to realize that many of them had not been performed on YouTube before, and I thought this was my chance to gain a few moments of fame. I started by creating a YouTube account and uploading my first performance. At that time, I was playing Okami and was completely hooked into its soundtrack. My first YouTube video ever was a beautiful song from that game. Soon after, many videos followed, and you can view them all here.